Novak Djokovic sent Peter Polansky of Canada to a 6-3 6-4 defeat on Wednesday as the four-time champion powered into the third round at the Toronto Masters before insisting he’s “comfortable” with the controversial ‘shot clock’ innovation. The match was played under threatening grey skies which eventually dumped heavy rain on the courts just after Djokovic wrapped up his win. In a match which began slightly late due to heavy overnight rain which continued into the morning, ninth-seeded Wimbledon champion Djokovic repeated a victory he scored over the Canadian at the same tournament in 2009. 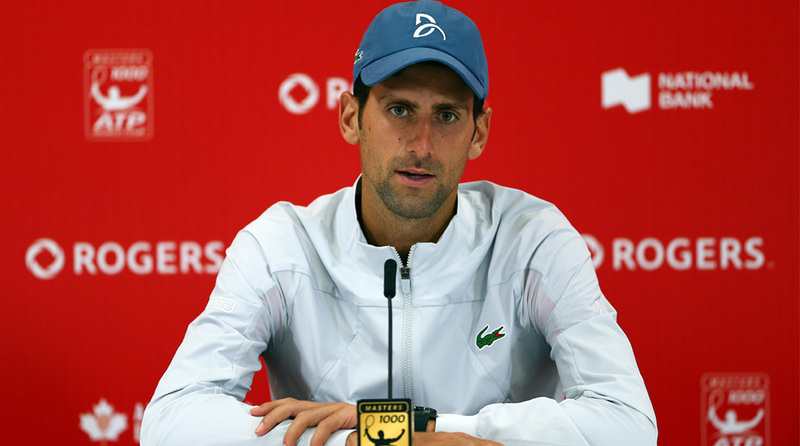 Djokovic said he was having no problems with the shot clock despite being a player who regularly picks up violations for the length of time he takes between points. “I actually feel like there is more time now than before because the shot clock starts counting down once the chair umpire calls the score,” Djokovic said. “Sometimes it takes several seconds before the chair umpire calls the score if it’s a long exchange or a good point and the crowd gets involved. Djokovic, 31, took 84 minutes on Wednesday to advance with seven aces and two breaks of serve while never facing a break point against Toronto-based wild card Polansky, the world number 121.